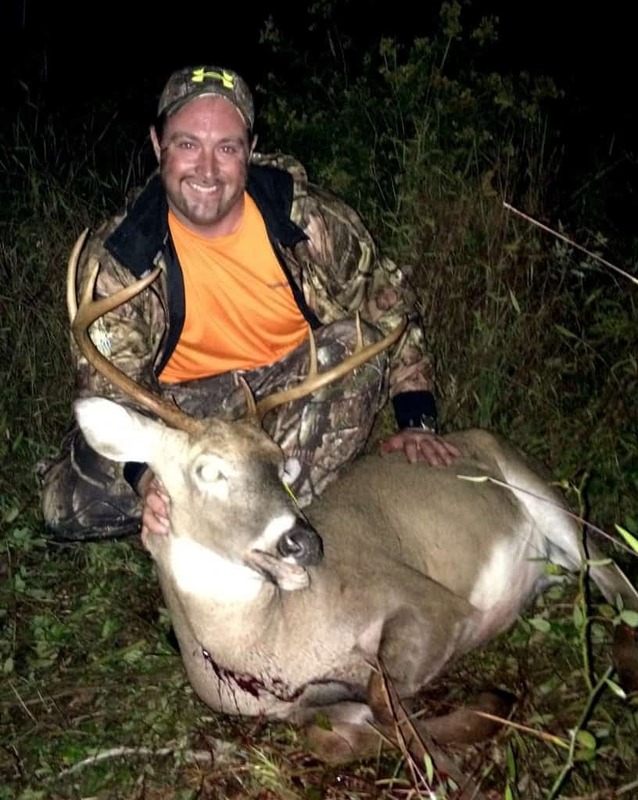 Guest Post by Justin Meyers: My First Archery Buck! - the4pointer.com | Real Hunts. Unreal Stories. 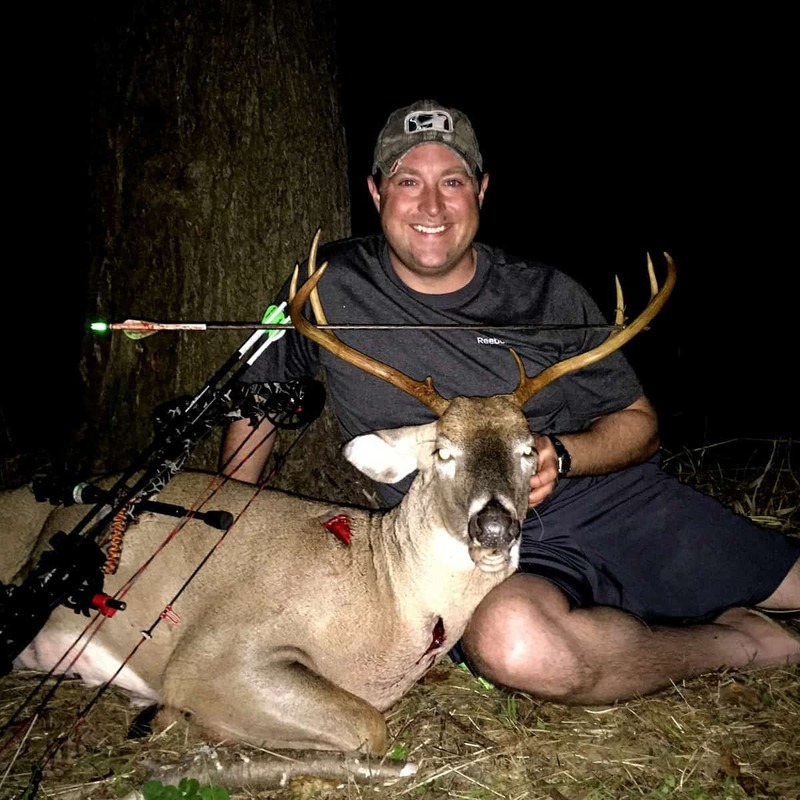 Guest Post by Justin Meyers: My First Archery Buck! When I saw Justin share a picture of his first archery buck on twitter (@RtHunter365) I had to ask him if he wanted to share the story of how his successful hunt. Justin lives in Pennsylvania and with a little hard work in the offseason he was able to secure permission to hunt a farm and it paid off! I hope you enjoy the read, I know I did. I began hunting in the fall of 2011 while on a test drive with my wife for a new truck. Yes, it is a weird way to start hunting but when you wife agrees to purchasing a new truck and follows it up with the ultimatum, “if we buy you this truck, you have to start hunting” you don’t argue. Fast forward to this year; one of my friends was lucky enough to meet a farmer that has 175 acres of farmland about 20 minutes from where we live and after helping him with some electrical issues in one of his barns, he granted access for both of us to hunt his property this coming season. 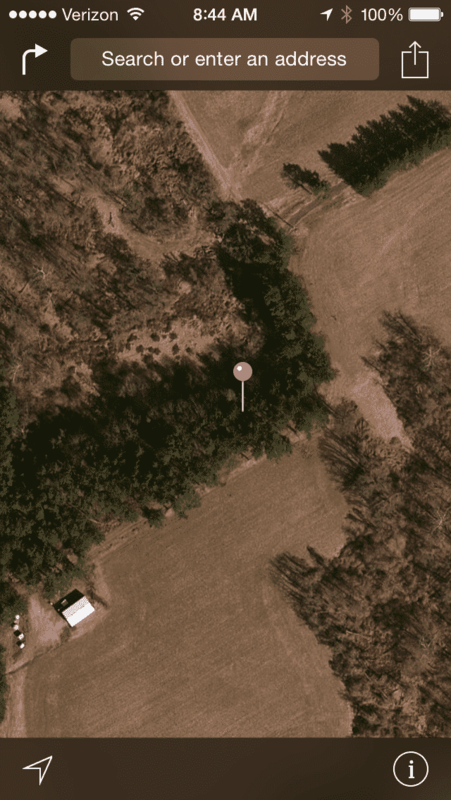 The property is an old school campus that has grown up over the past 20 years and has 6 fields of standing corn, good topography, and plenty of areas for bedding, feeding, and travel routes from one to the other. An absolutely perfect place to hunt deer. Late September we were at the farm and noticed a trail coming out of a perfect funnel of pine trees and hard woods between two corn fields and thick undergrowth. 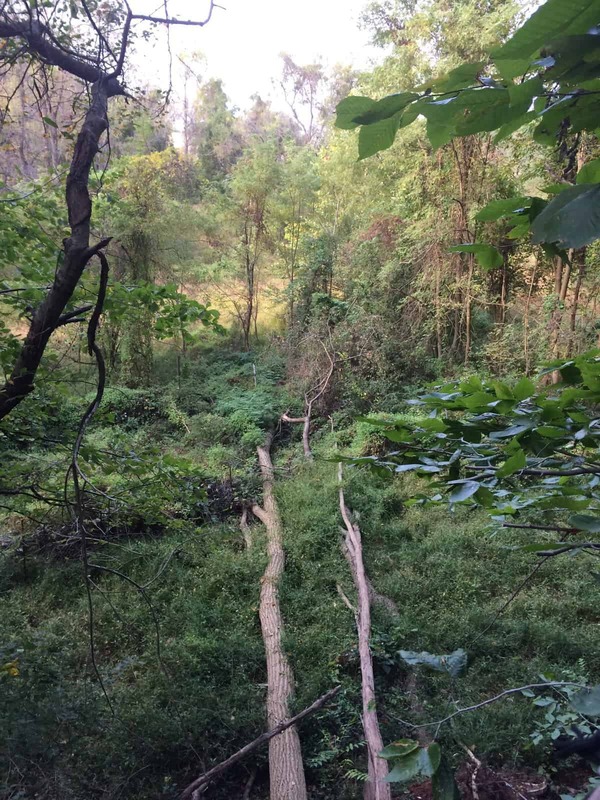 As we crept a few yards into the woods, we quickly noticed a scrape and a rub along the well-worn trail that meandered through the middle of this funnel. As we were sneaking out, I glassed the field that was at the bottom of the ridge that ran parallel to this hardwood funnel. I could easily see 5-6 more rubs. Most were on fairly large trees and showed a lot of shredded bark; these rubs were fresh and gnarly! This funnel ran from east to west, so when October 7th (four days after opening day for Antlered Deer) came around, we had a cold front coming in and a fairly consistent SSW wind I knew exactly where I wanted to hunt. As I walked into woods, I started looking for a good tree that would give me good vision of the travel routes moving through the funnel. I found a very straight pine tree would make for a fairly easy ascent with my climbing stand. Once I was up the tree I became very aware of how close to the entrance road I was and that the wind seemed to keep swirling over my shoulders and blowing directly across the trail and likely to where the deer would come from. After about an hour of debating whether or not to stay in my current location, I finally decided that the wind was completely wrong and I had to move. While I was debating this move I was able to use my binoculars to scout out what I thought would be a great tree in a much better spot. It was 4:15 pm and despite feeling tight on time, I felt if I could get down, move, and reset by 5 pm I would still have a good chance to salvage this hunt. By 5:15 I was reset in a new tree and it was perfect. This new position gave a great view into the heavy cover as well as access to the trail running through the funnel. 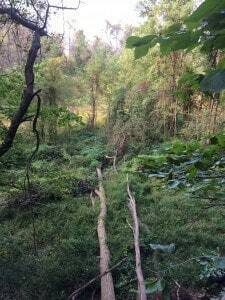 Luckily it also provided me with foliage both under and over my stand. By 5:45pm a mature doe and two yearlings had moved in directly under my stand and had come from directly behind me; if I had not moved positions, I would have had an easy 25yd shot at any of these deer but I would have undoubtedly been winded, possibly seen, and without a doubt the mature doe would have made my position and presence known to the entire farm. Luckily, my new position placed my tree directly between me and this mature doe. She looked, smelled, walked around, but could not figure out where I was or that something was wrong. As she continued to wander about, the two younger deer meandered about eating acorns and eventually the whole group made their way back up the ridge. The extra cover of foliage provided me great protection but also kept me from getting a clear shot at any of these deer. As darkness fully descended upon me, I slowly gathered my things, and climbed down the tree. As I got down, I could see my glowing knock about 15 yards away. I left all my stuff by the tree and quietly snuck out to check and retrieve my arrow. As I walked up to it and hit it with my flashlight, I was completely surprised to see it covered in blood from ground to knock! I carefully backed out, gathered all my stuff and made my way back to our truck. After a few minutes of confused conversation and convincing my buddy that I was not kidding and that yes I had shot a buck we grabbed our flashlights and slowly made out way back to my arrow. Upon arrival we found good sign at the point of impact and there was a lot of fat and tissue on the arrow along with bright red blood. The blood trail was light for the first 15 yards but once we got to where the buck had stopped to look around we found a good blood trail. About 60yds later we found him! He had wandered about 50 yards made a little loop and then collapsed. The arrow had slid behind and just over his right shoulder and out his neck cutting a major artery. I could not have been more excited! I had done it – harvested my first buck ever! Hunting is My Life, it’s Who I am! “Davie, Why do you hunt?” This is a question I have been asked several times before, so here is my answer. It can be hard to put into words, but I will do my best. It’s more about the experience, and if you have never hunted before, it’s hard to relate.